In a number of El Nino years, Indian monsoon has been normal. NEW DELHI: Latest updates from two global weather prediction agencies have added to the spectre of a developing El Nino, raising fears of a possible weak monsoon this year. Indian Met officials are treating the reports with caution, saying that though chances of an El Nino developing around mid-2014 are growing, predictions made at this stage suffer from low accuracy. El Nino — 'the boy' in Spanish — is an unusual warming of sea surface waters in eastern and central equatorial Pacific associated with changes in wind patterns that impact weather in many parts of the world. It generally has an adverse effect on the Indian monsoon. In its update on Thursday, the Australian Bureau of Meteorology said factors that lead to an El Nino were now increasingly visible. "The tropical Pacific Ocean subsurface has warmed substantially over the past few weeks, which was likely to result in a warming of the sea surface in the coming months," it said. "A recent burst of westerly winds over the far western Pacific is the strongest seen since at least 2009 - the last time an El Nino developed," the bureau added. The agency said most climate models it had surveyed were showing temperatures approaching or exceeding El Nino thresholds in the coming summer. US agency NOAA's Climate Prediction Center, which updated its forecast on Wednesday, said temperature anomalies associated with El Nino had strongly increased since the end of January. NOAA said there was a 50% chance of El Nino developing during the summer or autumn this year. "There's a good chance of El Nino forming this year. 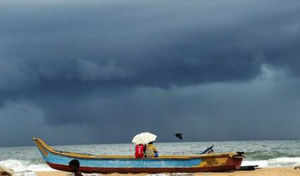 But whether — or how much— it would impact the Indian monsoon would depend on its intensity and the timing of its onset," said D Sivananda Pai, India Meteorological Department's lead monsoon forecaster, adding that the picture would be clearer after April. Pai's predecessor M Rajeevan, currently advisor to the earth sciences ministry, agrees. "Monsoon predictions made during this time of the year suffer from a 'spring barrier'. Accuracy increases after spring. We need to watch the developments closely," he said. The causal links between El Nino and the Indian monsoon aren't totally understood. While a majority of bad monsoon years — when rain deficit is 10% or more — coincide with El Nino events, the reverse link isn't that strong. In a number of El Nino years, Indian monsoon has been normal. One factor that seems to negate the effect of El Nino is a positive sea temperature difference between western and eastern Indian Ocean — a phenomenon called Indian Ocean Dipole. However, IOD this year is expected to be neutral.